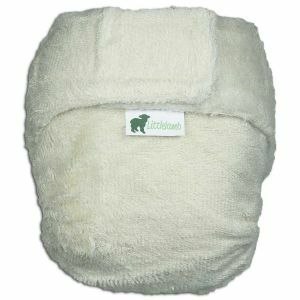 An absorbent sized bamboo nappy that requires a waterproof cover. An ideal night nappy system or for heavy wetter during the day. This two-part system is also great for newborns as it's great at containing poo explosions! When it comes to a thirsty nappy, this is it. Matched with a LittleLamb wrap it'll absorb most of what your baby can throw at it. All bamboo nappies fasten with Velcro. The size 2 fits babies from around 20lbs-38lbs (9kgs -17kgs) which should fit babies from about to potty training. The size 3 which fits from 35lbs/16kgs. All bamboo nappies come with a fast dry fold-out bamboo booster sewn in place except for the size 1 which now comes with a separate bamboo booster. They also come with a fluffy fleece reusable liner. As this nappy is very absorbent it can take a very long time to air dry. It may take a few days to dry on a clothes horse inside.